Qi is a Chinese term used to refer to all types of energy. It is the intrinsic substance or the "vital force" behind all things in the universe. Gong refers to the power to produce an effect, an attainment of, or accomplishment that is achieved with steady practice. Loosely Qigong, can be translated as the study of Qi. Today, Qigong is most often referred to as any set of breathing and Qi circulation techniques that are capable of improving health, preventing illness, and strengthening the body. From ancient China until today, Qigong exercises have been important healing and rejuvenating exercises. The thousands of years of development, also documents it as an excellent way to maintain health and fitness. Our school teaches several different courses and workshops in Qigong, including Medical, Taoist, Buddhist, Wushu Qigong, as well as a course in Emitting, Absorbing, and Healing Qigong. The Therapeutic Qigong course is suitable for health practitioners, people with shoulder, neck, back, or knee discomforts; and for overall health maintenance to improve the quality of life. This course focuses on 20 Therapeutic Qigong exercises created by Dr. Wang, Zi-Ping and systematized by Dr. Wu, Cheng-De in 1958. Theses exercises were based on ancient Qigong exercises and Dr. Wang's decades of clinical experiences. For over four decades since it was published, hundreds of thousands of people all over the world have benefited from it. The Health Rejuvenating Medical Qigong course, also referred to as Restorative or Maintenance Qigong, is set up in a 12 week period. 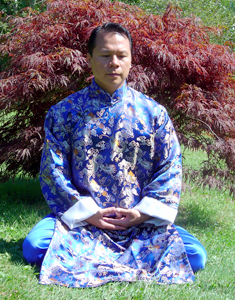 The course consists of traditional meridian and organ Qigong techniques. This Qigong course is designed for strengthening organs, maintaining health, and regaining health after an illness. Qigong is relatively simple and easy to learn, making it an effective way to stay healthy in the fast pace society we live in. The effectiveness of these Medical Qigong techniques have been well documented by many Qigong masters, Qigong centers, and health care organizations in China. The Emitting, Absorbing, and Healing Qigong course is designed for healers and for health professionals; and for individuals interested in becoming a Qigong or Taijiquan instructor. The Taoist, Buddhist, and Wushu Qigong workshops are designed for increasing one's energy, for developing extraordinary powers, and for spiritual development. Workshops are scheduled periodically. If you are already on our mailing list, you will be notified of up coming workshops and courses in Qigong. Twelve week courses. Please check the New Courses link for current class information. No open enrollment.